My Absolute Beginner Tatting Series is getting great feedback, and we’re almost to the end of the absolute basics. Beginners, don’t think that is an invitation to get complacent, as there is still plenty to learn. Here’s a question for all you experienced and advanced tatters. What do think a beginning tatter needs to know to be successful? Beginning tatters, what do you struggle with? What isn’t clear, or what would you like to learn? Give me your questions—any and all—and I’ll see what I can do to give back some clear answers. What about what to do when you run out of shuttle thread but haven’t finished a pattern? Also when you start looking at patterns – you get things like lock joins, switch shuttles – but on the whole just keep what you’re doing as it’s been invaluble so far…. Ann, these are good questions, thank you, and I think those are common problems so they will all get a at least a post and maybe a tute. If you think of anything else please do mention it. Ann, you also asked about what to do when you run out of shuttle thread partway through a pattern. The last tutorial on adding a new thread is how you do this. When you are running out, end at a good spot (the end of a convenient ring) and add your new thread there. Then cut off what is left of the old shuttle thread, leaving two or three inches, and hide that end along with the new thread end in your next chain or ring. Hope this helps. Hmmm, this is difficult. To get the most satisfaction from tatting I feel the next stage should be plenty of practice. That increases speed and better tension and greater satisfaction. There are thousands of very, very pretty patterns (loads free too) using just rings and chains – they kept me very happy for the first 30 out of 55 years!!! Next thing I feel should be taught is probably the split ring. Jane, I agree that lots and lots of practice is in order. I hope to take a little time to finish up a couple of patterns I’ve been working on to post here too. Thanks as always for your advice! i think new tatters need to know that it takes time to learn, and not a lot of people learned right off the bat. so be patent. also un-tatting is important to teach. This will be a great resource for beginners tatters and all! How to prep for tatting: Winding the shuttle (attaching the thread without a knot, direction of the winding, how full to load the shuttle) Over time, each tatter will decide how they like to hold their shuttle: (with a pic) pic up and front, up and back, down and front, down and back. The position each tatter is most comfortable with determines the direction to wind the shuttle. Most tatters wind away from the body so that the thread feeds out from the side away from the work, but not everyone favors that most. Also, some tatters like the thread wound toward themselves, so it is a purely personal matter. We all have different preferences dictated by the size and shape of our hands and the degree of flexibility of our joints or medical conditions. THE FLIP, ring, chain, picot, join, reverse work AND how to untat including opening rings and undoing DS. For early beginners, provide rings to dissect! It won’t hurt their feelings so much! Also, how to read patterns and diagrams; they are all so different. After wrestling with everything from Mlle. Riego to diagrams with no text at all, I have found that interpreting patterns is most difficult when trying to understand where to join! It is very good to have a large diagram and trace the path of the work. Anything that you can do with your hands and fingers to understand the path of the work is helpful. 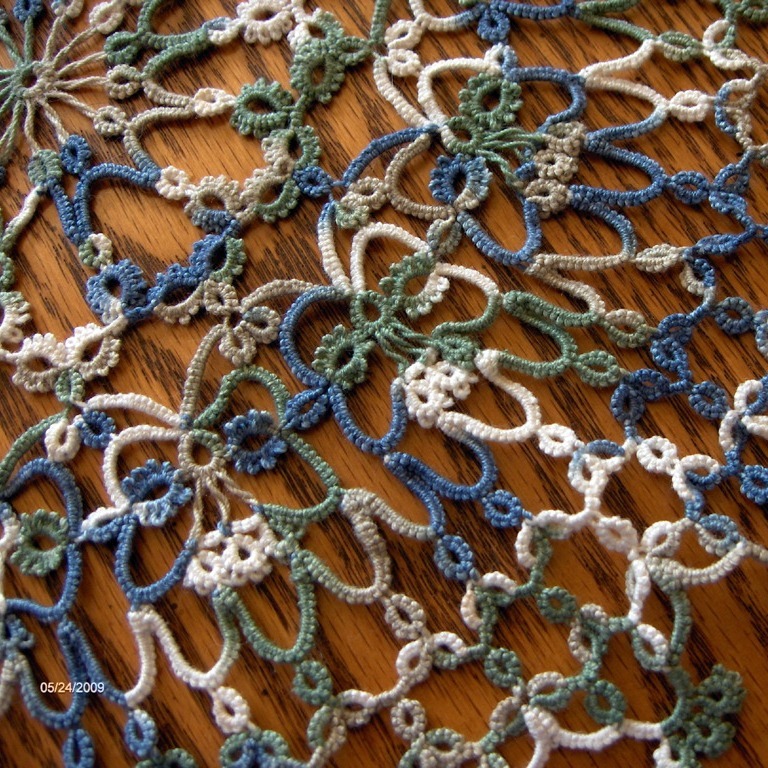 The final skill in interpreting patterns is to be able re-route the work for continuous tatting. Split rings and split chains as soon as the newbie is comfortable with rings and chains and joins. it is very important for beginning tatters to practice, practice, practice, that will allow them to get their tension and element placement better. for intermediate tatters, they should learn how to read the various different types of pattern notation. Also very helpful would be split rings, split chains and Self-closing mock rings. these will allow them to climb out from one round to the next and to add interesting elements to their projects. another thing that would be an extension of the split rings, would be frontside/backside tatting. this is important if they ever want to enter a juried show such as their local fair. Well, I am still kind of confused about the basics of pattern reading. I mean, I needle tat, so I can read it, but sometimes I’m not sure how to go from one thing to another when using a shuttle. Does that make sense? Okay, that doesn’t make sense. Maybe practice patterns and tips are what I’m looking for? The best pattern writers will show you in the visual where to start, end, and what direction to work in. If you’ve ever looked through the old DMC library that is now public domain, there is very little direction at all – they assumed you knew how to tat and would figure it out. The more you tat the more comfortable you’ll get with pattern reading, even to the point of being able to spot incorrect directions. Shell, yes, that does make perfect sense. It takes a lot of practice, but I’ll try to include some tips to make the practice easier too. Leah, I like how you solved your split ring difficulties. Yes, there is often more than one way to do something and a bit of creativity often goes a long way! Thanks for the feedback. Those are on my list! – I’d like something that translates shuttle tatting to needle tatting. I can usually only find super simple needle tatting instructions, and it seems shuttle tatters get all the cool tricks and flips. – I would love a few very simple patterns, as I am currently getting the rhythm and feel for it with about two patterns I keep repeating. Maybe simple is not the word I want… Something quick, perhaps, that can be practiced over and over till it’s right but won’t take hours to work on. Kim, I enjoyed your blog post very much, and especially appreciate your attitude that any new skill will take practice. Tatting certainly does take practice–it has a pretty steep learning curve–but once you get the hang of it I promise it is one of the easiest types of handwork/needlework to do. Keep at it! Cent one: Here’s my post about reading patterns and simple projects that should keep you occupied for a little while. http://www.tattedtreasures.com/2011/09/reading-patterns-and-making-projects-part-1/ I’ll be posting more easy patterns soon, so check back. Cent two: Until you get into the really fancy stuff, you can do just about anything with a needle that you can with a shuttle. Some things take a bit of a different technique, like split rings, but I wouldn’t worry about those yet. Most patterns at a beginner level are the same instructions for both. Let me know what other questions you have. I’m glad to help. Daphna, could you tell me a bit more about how it is twisting? I have been needle tatting for more than fifteen years-and you all make it sound way harder and more complicated than it is.Tatting with a needle is like casting on in knitting-in both directions. It is simple to learn.You can chose simple or very complex patterns. With needle tatting-the needle should be relatively the same size as the thread.I love tiny threads-but needle tatting or shuttle tatting works great with many sizes of thread. Although I am a needle tatter-I have NEVER found a pattern I couldn’t work with a needle.I have found many things that are EASIER with a needle than a shuttle.I LOVE TATTING! Hi Patrice, so nice to hear from you. I didn’t realize we were making needle tatting sound hard–it is way easier to learn than shuttle tatting. My personal preference is for shuttle tatting, as I enjoy the feel of making it better, and prefer the look of the finished product more in general, though I have seen some really fabulous needle tatting that was done so well I couldn’t tell it was made with a needle. That said, I do encourage people to try needle tatting as it is an easy way to learn or to carry on long term. It is how I first learned to tat and is a great option. I am a relatively new tatter. There is an abbreviation in my instruction sheet I cannot find an answer to. I hope you can help. ” vsp ” The only thing I can come up with is “very small picot”. Yes, vsp means very small picot. I am wondering if there is a trick to join 2 picots after the fact? I forgot to connect the last 2 rings before I finished the pattern.